Closed on Monday, July 1, for the observance of Canada Day. Are eggshells always fragile? Does toast always land buttered-side down? Put these myths and others to the test! Learn new things about old friends in a camp millions of years in the making. Explore the full range science has to offer, from chemistry to physics to engineering. Discover the best of chemistry, physics, and biology! All instruction in this camp will be in French so children should have a familiarity with the language prior to enrollment. Current Canadian Parents for French (CPF) Vernon members receive a $25 discount. Please register at our Front Desk to receive CPF discount. Do you have what it takes to survive this camp? Learn the science behind survival tips and techniques. Calling all future astronauts! Learn all about space and what it takes to be an astronaut. Learn the science behind exciting art projects. Let your inner mad scientist shine with our collection of exciting, intriguing, and strange experiments! Mummies, mysteries, & the science of ancient history. Your mission, should you choose to accept it, is to learn all about modern sleuthing and sneaking! Closed on Monday, August 5, for BC Day. Are you a wizard or a warrior? Examine the science behind wizardry and magic. Build catapults and other medieval weapons. Investigate the world of chemical reactions, mixtures, and solutions. Don't forget to bring your best mad scientist cackle! Explore chemistry, physics, engineering, and biology. Learn how insects are built. Study them under microscopes. Build bug catchers so you can go home and capture your favourite insects for Mom! Life is a game! Learn to play it well! 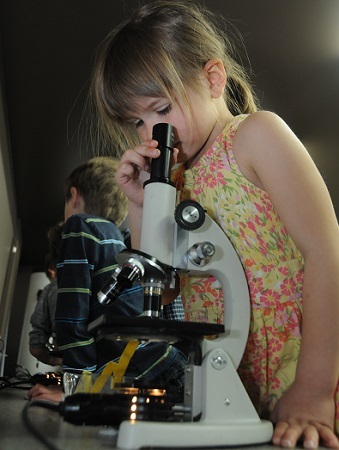 Get swept up in a week of sea science as we bring the coast to the Okanagan! One day this gross is all we could handle. Only strong stomachs need apply! Calling all aspiring inventors! If you want to master machines this is the camp for you! Hands in. Hands on. Mighty fun. Might be messy. Cancellations made with at least one week notice will be eligible for a full refund. Cancellations made before the camp starts, with less than one week notice, may be eligible for a partial refund or camp credits. Once the camp starts we will not be able to make refunds or give credits.